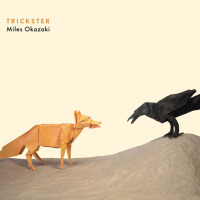 There is nothing deceptive about guitarist Miles Okazaki's Trickster. It is simply an elegantly crafted work that engages with its narrative quality and its darkly hued, intriguing texture. 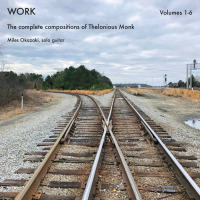 On his fourth release as a leader the New York based Okazaki leads a quartet that consists of two of his bandmates from altoist Steve Coleman's Five Elements, bassist Anthony Tidd and drummer Sean Rickman. Dynamic pianist Craig Taborn rounds up the group. Okazaki and Taborn open the album on a high note with the stimulating and inventive "Kudzu." Their concurrent lines interweave as they state the engrossing theme. Rickman and Tidd create a hypnotic backdrop with a soulful swagger. Taborn complements Okazaki as he introduces delightful angularity to his deft, spontaneous melodic embellishments. 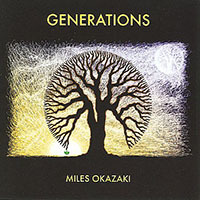 Okazaki's improvisation, meanwhile, transforms with agility from serene and contemplative to vibrant and incisive. Another highlight of this gripping record is "The Calendar," a piece about the Egyptian god Thoth. Like folkloric characters that inspired all of the tracks on the disc, Toth was a trickster who, in Ancient Egyptian mythology, beat the Moon in a dice game. Okazaki starts off with a pensive mood and sparse notes. Tidd showcases a subtle lyricism with his organic phrasing while Rickman plays crystalline rhythmic structures with sinewy confidence. As the tune progresses it picks up tempo, density and fiery passion. Some of the most excitingly complex performances are on the crisp and earthy "Caduceus." Taborn and Okazaki overlap melodic fragments that make up an engrossing duet where each musician is in complete synergy with the other yet he maintains his own individuality. It is as if the composition has two distinct voices yet they are part of an indivisible whole. Through it all Rickman and Tidd lay down an infectious, dancing groove. There are points where the creative momentum slacks just a tad. An example is the funky "Black Bolt" that thrills with its intricacy but disappoints with its aimlessness. These, however, are minutiae and do not distract from the ingenuity and maturity of the overall recording. 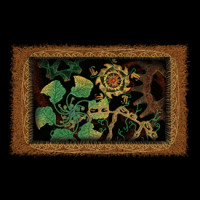 Okazaki's Trickster is both enjoyable and thought provoking and deserves several listens to uncover all of its enchanting layers.